This month, my collaborator Katye Coe and I will be presenting a work-in-progress performance of No-How Generator as part of Per/Forming Futures, a conference at Middlesex University (London) organised by Artistic Doctorates in Europe, April 11-13. No-How Generator is the choreographic work that I'm developing as the focus of my current practice-based PhD. Last month, we performed the work-in-progress at Eintanzhaus in Mannheim, Germany, and at Dance4’s iC4C in Nottingham. Earlier this year, I performed a solo version of this in New York as part of Dance from England at Future Oceans, APAP NYC 2019. Last autumn, my science-fiction performance-lecture Now That We Know was back at Sadler’s Wells Lilian Baylis Studio, accompanied by a symposium with guest speakers to launch the ‘Institute of Neurochoreography’. You can find the archived live stream of the symposium here. Also last autumn, I performed Now That We Know at De Montfort University in Leicester, and presented a research seminar with Guy Claxton at De Montfort’s CIRID (Centre for Interdisciplinary Research in Dance). You can find an audio recording of this event here. I also recently gave a talk at Talbot Rice Gallery in Edinburgh with artist Mark Bleakely as part of his project Schema, Chapters I-III. 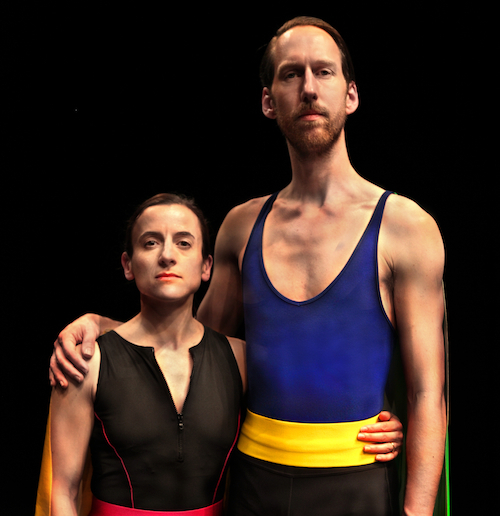 Rachel Krische and I also recently performed our 2011 duet Do Not Be Afraid in Bologna, Italy, as part of Teatri di Vita’s Cuore d’Inghilterra festival. An iteration of my solo installation Loop Atlas, first commissioned and performed last year as part of the Siobhan Davies Dance group show material/ rearranged/ to/ be, was also showing in recent months: the video installation version, Loop Atlas IV, was part of the exhibition Pursuits of Happiness at De Montfort University’s The Gallery in Leicester from May to August. Since October 2017, I’m excited to have begun a practice-based PhD that brings new kinds of support to my choreographic practice for 3 years. Thanks to AHRC funding from Midlands3Cities and partnership support from Dance4 and Siobhan Davies Dance, my PhD will be based at De Montfort University in Leicester. Finally, I’m delighted to announce that the first results of my 2-year science research collaboration have been published in the form of two co-authored scientific papers: Joint Action Aesthetics (in the journal PLOS ONE) and The Choreography of Group Affiliation (in Topics in Cognitive Science). This collaboration with co-investigators including cognitive scientist and dancer Guido Orgs (Goldsmiths) explored the links between synchronous movement, group co-operation and the performing arts. I created the choreographic work Group Study through and for this research process. Read the press release for the first paper here. To receive my occasional newsletter, sign up here.